FabricLovers Blog: Blog Interview and Give-Away! I am from a family of artists; my wonderful grandparents were artists-- grandmother was a high school art teacher and my grandfather was a fashion illustrator and product illustrator. So I was trained at an early age in art. 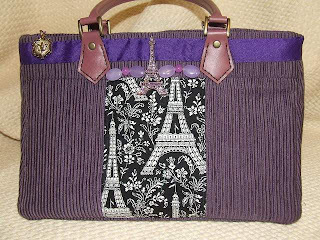 I began making handbags after a trip to New York City. I was there as a treat for myself because it was my birthday, and I wanted to see all the art NYC is known for. While there, I bought a Chanel handbag. There in that beautiful city, with my wonderful bag, I saw all the other women with all the top designer accessories and bags--- but it wasn't what I thought it would be! Don't get me wrong-- the art was AWESOME! But it was as if everyone had the same bag!! So I went home, put my Chanel back in it's dust bag, and sat down and designed the most wild bag ever. I did go back to New York later, and I took that bag. Women all over the place were asking me, "Where did you get that bag?" I knew then that is what I wanted to do--design my own!! So I began numbering my bags (never to repeat a design) and I am at #2388. 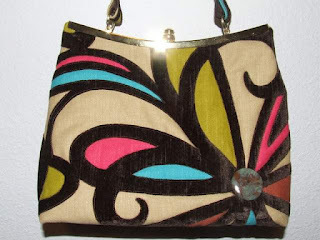 I design, make each pattern, make each bag--from concept to completion. I did my first art fest in Eatonville, Washington in 2004. I didn't know how I would do or how it would turn out there. I think I had maybe 20 bags....I had a few of my paintings hanging to make it look good...funny-- looking back on that day--though it was wet, cold, and raining, I sold out! FL: Where do you get your inspiration for your designs? FL: What is your favorite part of the design process? ...hmmmm well, taking this peacock fabric I had found in Washington state (was it really 8 years ago!? )...I feathered the bird on the fabric just like it was on the real bird, from the crown to the tail feathers...then painted the fabric flowers to make them pop out. Or cutting out leather leaves-- then hand sewing them on fabric. Then sewing gemstones on top...too many to list and still working on more. FL: What are your favorite color combinations right now? Thanks, Tracey, for allowing me to interview you! I hope you, the reader, have enjoyed the interview as well, and all the yummy purse photos! Now onto the Contest. 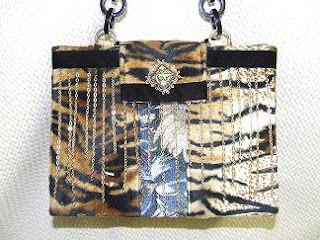 To be entered into the Contest to win one of Tracey's one-of-a-kind bags, click over to her website HERE, browse through her purses, then come back to this blog post and enter a comment below listing at least one of your favorites from her site. The winner will be chosen at random; only one entry per person, please. (Winners must have a USA shipping address) Contest ends at midnight PT on July 12. 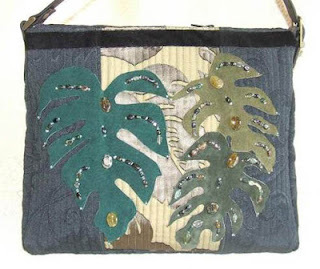 Tracey has also generously offered a 10% discount off any purchase you make from her now through July 31. Mention the code BAGS to claim your discount. And one final note: while this blog post was under construction, Tracey informed me about two exciting things that had just happened to her. First off, she won FIRST PLACE in 3-Dimensional Art at the Bridgeton River Fest! Here she is holding her ribbon. 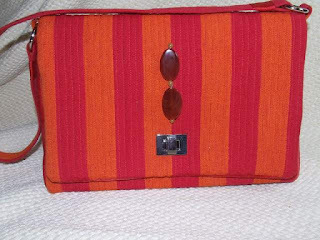 The second exciting thing is that her purse below has made it to the top 15 in a contest run by Timeless Treasures! 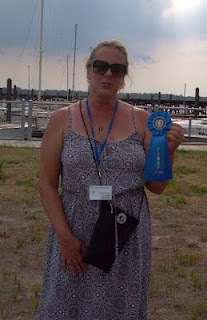 That means her purse has made it to the last round of judging, and Tracey is eagerly awaiting the final results which should be out next month. Let's all wish her good luck! Do you, or does someone you know, have a business that would be a good fit for an interview? I'd love to work with you! Leave a comment below, and I'll get in touch. 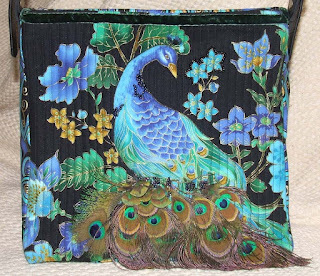 I love almost every purse, especially the ones with the peacock feathers, but I have to be logical about this - I have cats, and they have no respect. My favorite non-feathered purse is #2318 (next to the question above about her favorite part of the design process). It has a retro feel that I really like. Love, Love, Love...Great ART. 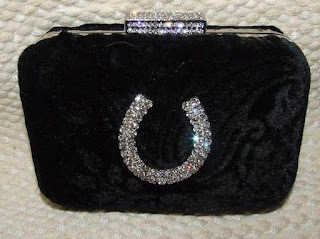 I would love a handbag with a Seahorse to give away as a gift. 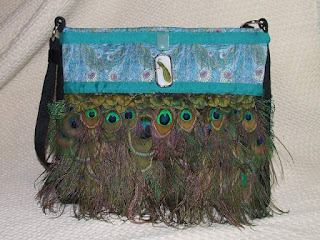 I have 9 of Traceys purses and I love all of them but the one with the colorful feathers 2388 has tickled my fancy. I may need to go for 10!!! 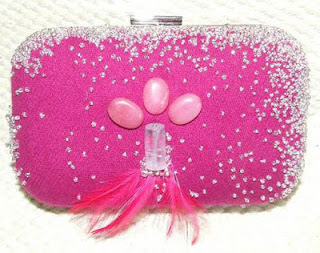 Tracey has so many gorgeous purses but 2352 - Greta Garbo is my favorite right now. 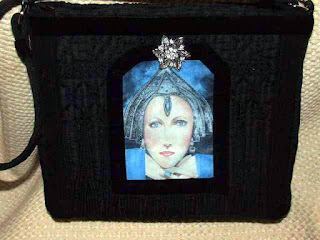 She is as talented with the brush as she is with fabric, and this purse combines both of her passions, and has a link to her Grandfather who painted many stars. I enjoyed viewing all the bags, but my one favorite is the 2352 It is just so classy. I seen many that would be nice to own. I have 3 of Tracey's bags ... she knows I go for "slippahs" AKA flip flops and anything Hawaiian/tropical. My picks are ... 2397, 2392, 2390 and group 10! So proud of you, Tracey!!!!!!! Tracey, you know that I love all of your bags. I have just one, but would love to have another. My picks are: 2204, 2389, 2192, just to name a few! Great article about you. Keep it up girl. Join me in this journey called life that, for me, just happens to include fabric, family, pets, friends, and did I mention lots of fabric?! Flower Sale and New Items!